with regard to the +4 cells in the intestine at the place we expect it. I have discussed this enquiry with my colleagues. A BLAST with the immunogen in the human proteome does not predict cross-reactivity with any other proteins, just BMI-1 and partial BMI-1 sequences. It could be a cleavage product, but I have been unsuccessful in finding a publication that shows this. 1) "E4F1: a novel candidate factor for mediating BMI1 function in primitive hematopoietic cells." Chagraoui J., Niessen S.L., Lessard J., Girard S., Coulombe P., Sauvageau M., Meloche S., Sauvageau G.
Cited for: FUNCTION, INTERACTION WITH E4F1, SUBCELLULAR LOCATION. 2) "Interaction proteomics analysis of polycomb proteins defines distinct PRC1 Complexes in mammalian cells." Cited for: IDENTIFICATION IN A PRC1-LIKE COMPLEX, SUBCELLULAR LOCATION. Please see attached the image of Bmi1 staining with FFPE rat thymus sections. 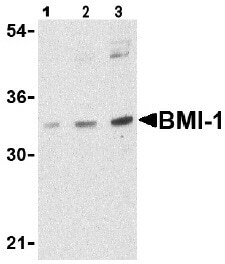 This Bmi1 antibody can detect typical “+4” cells in the small intestine. than in the nucleus, where they should be. permeabilizing agent in any dilution buffers? recommended and can greatly speed up our investigation of your problem. Thank you for your enquiry regarding ab38295 and for taking the time to provide some useful details of the experiments. I am very sorry to hear that you are having problems with this antibody. My colleague has asked me to look after her customers while she is busy with other projects. I apologize for my delayed response. - Question: Would you be so kind to confirm the purpose of washing the fixed tissue in tap water? Normally, for rehydration it is recommended to use TBS-T.
- Question: Has the time for AR been optimized and so what equipment was applied (microwave, steamer, vegetable cooker etc)? Three minutes is only suggested as a starting point antigen retrieval time. 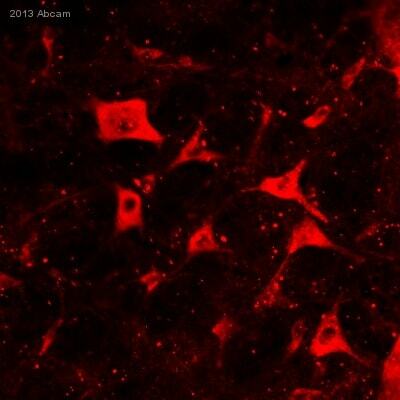 Less than 3 minutes may leave the antigens under-retrieved, leading to weak staining. More than 3 minutes may leave them overretrieved, leading to non-specific background staining and also increasing the chances of sections dissociating from the slides. A control experiment is recommended beforehand, where slides of the same tissue section are retrieved for 1, 2, 3, 4 and 5 minutes before being immunohistochemically stained to evaluate optimum antigen retrieval time for the particular antibody being used. ersehen können befindet sich das Bmi1 hier zwar in den Zellen, die lt.
zumindest erreicht haben. Für eine Nachricht wäre ich dankbar. Es tut mir Leid zu hören, dass Sie Probleme mit diesem Antikörper haben. Laut unseren Unterlagen haben wir den Antikörper nicht selber in der IHC getestet, sondern haben diese Applikation aufgrund einer Publikation aufgenommen. Falls sich allerdings bestätigt, dass der Antikörper nicht so funktioniert, wie auf dem Datenblatt beschrieben und er innerhalb der letzten 180 Tage gekauft wurde, werden wir Ihnen gerne einen Ersatz oder eine Gutschrift schicken. Please check below reply from the customer .Thank you! 2.) I can stronly recommend to use also an other blocking buffer, as changing the blocking buffer can significantly improve the results. I can recommend to use BSA as an alternative blocking buffer. Please see image on the datasheet of ab9385 as an illustration. I have done what you advised, but it still didn’t work. 3.) Can you please let me know whether the samples have been reduced? If not, I can recommend to do so, as the antibody has been tested under these conditions. The samples were not reduced, for I have tried different samples. 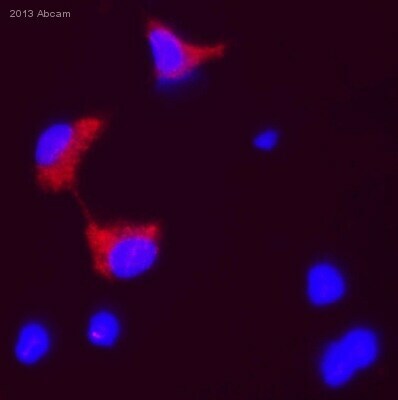 And for an antibody for another protein, the result was good. 4.) Lastly, can you please confirm that the secondary antibody used is known to work? 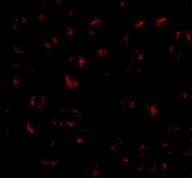 The secondary antibody used was commonly used in my lab, and it did work well. Thank you very much for following this up with the customer. I am sorry that the change in the blocking buffer did not improve the results. I would still like to recommend to the customer to reduce the samples for the Western blot either with DTT or beta Mercaptoethanol. Indeed, not all proteins need to be reduced to be visible in the Western blot and I am not sure whether it is necessary to reduce the samples to see a nice band of BMI1. As however the BMI1 is a highly complexed protein (http://www.uniprot.org/uniprot/P35226) and we have tested it under reduced conditions, I think there is the possibility that reducing the samples could solve the problem. As I understand howeverthe frustration the customer must be experiencing, I will provide a credit note for this antibody. Please do let me know whether the customer would like to accept this. Thank you for your cooperation. I am looking forward to hear back from you. 3) Storage conditions:Store at +4°C.